How to Play Chess. Who doesn’t want to be a cool intellectual and play chess like a pro? This game definitely stands out from everything else and has tons of admirers all over the world. So do you want to join in and learn the basic rules and even some winning tricks and techniques? In that case, this video guide is what you’ve been looking for. To win and become a true chess champion, your task is to checkmate your opponent’s king. It may sound like a piece of cake, but it’s way more complicated than you might think! Checkmate basically means putting the king in a position where he’ll be captured because he can’t move or be protected by any other piece. The more of your opponent’s pieces you capture, the easier it’ll be to checkmate. Just don’t focus all your energy on this. Your own king should be properly protected at all times so that your opponent can’t get to him. -A chessboard consists of 64 square spaces. There are files, which are the columns going up and down, pointing at you and your opponent and marked from A to H. And then there are ranks: the horizontal rows from 1 to 8. -The rook is placed at the corners of the board, which are A1 and H1 for one player and A8 and H8 for the other. The best thing about rooks is that they can move any number of vacant squares both vertically and horizontally. -Knights are placed on squares B1 and G1 for one player and B8 and G8 for the other. Unlike rooks, knights can jump over other pieces, and they’re actually the only piece that can do that. -Bishops can move over any number of free squares in a diagonal direction. Just like rooks, they can capture an opponent’s piece standing in their way by stopping on that piece’s square. -You only get one queen (D1 for a white queen or D8 for a black queen), and she’s the most powerful piece on the board — basically the rook and bishop combined. The king’s place is one of the 2 last empty squares: E1 and E8. The king isn’t as powerful as the queen and can only move one square at a time horizontally, vertically, or diagonally. -Pawns take the rows from A1 to H1 for one player and from A7 to H7 for the other. Pawns move one square forward with one exception: the first time they move, pawns can go forward either one or 2 squares. 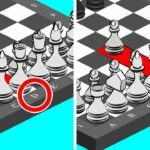 -Checkmate basically means putting the king in a position where he’ll be captured because he can’t move or be protected by any other piece. The more of your opponent’s pieces you capture, the easier it’ll be to checkmate. -Pawns, for example, are stronger when they’re together in chains to protect one another. Knights can control up to 8 squares, but when you put them near the edge this number gets cut in half. Bishops are at their strongest when they’re on or near long diagonals – they can control more squares. Rooks have the most power in open files. -If you want to make your own rules on the chessboard and be the main force of the game, try to control the center of the board. Your opening can help you do that: a D or E pawn is a great way to start and open the center of the board. -“En passant” is a special capture move that a pawn can make. If you’re playing with white, your pawn must be on the fifth rank for it, and it’s the fourth rank for black. -If a pawn reaches the far side of the board, which is the eighth rank for white and the first rank for black, it must immediately be promoted to any other piece (except for the king). -To make the “castling” move, move your king 2 squares toward any rook, and then hop that rook over the king so it lands on the square next to the king.